Valletta's magnificent medieval cathedral is famous for the painting by Caravaggio, which hangs in its oratory, and the 369 inlaid mosaic marble tombstones that cover the floor. Each tombstone depicts the lives of the Grand Masters of the Order of St John, buried beneath. The façade is rather sever and militaristic. Yet inside, the cathedral is lavishly splendid in the grandest tradition of high Baroque. Carvings cover every each of wall, while the vaulted ceiling sports paintings depicting the life of St John the Baptist, patron saint of the Knights. The cathedral benefitted greatly over the centuries from many donations given by the Knights and their Grand Masters. Some of the most impressive works of art were gifts from the order. It's still an active place of worship, with frequent services, and also operates as a beautiful venue for cultural events. 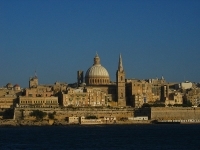 The stunningly ornate cathedral is an exceptional sight and a must for tourist in Malta. Guided tours and rented audio guides help to greatly enrich the experience. Travellers should be sure to check the website for visiting hours to avoid disappointment.